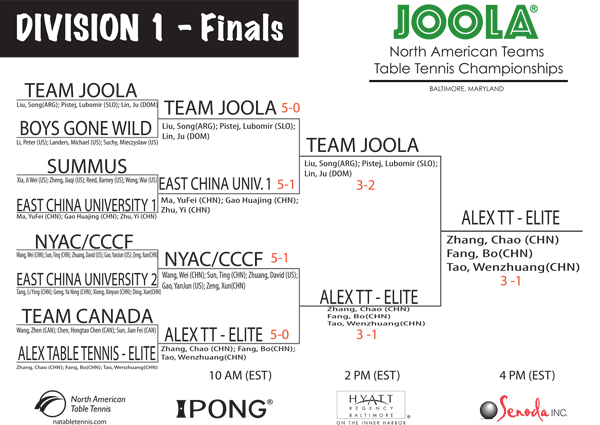 November 27, 2011 November 27, 2011 - TEAM JOOLA, TOURNAMENTS, Where's JOOLA? The Teams tournament has been going on all this weekend in Baltimore’s Inner Harbor. We hope you have been able to attend but if not you can stay updated in a couple places. NATT (North American Table Tennis) is live streaming matches from the Top Division. You can watch here. The results for all divisions are being posted as they come in, so you can check and see how your favorites are doing at this website. We are also taking team photos and posting them all on our Facebook page, so stop by there and see if you recognize anyone.